Shakshuka is a Middle Eastern breakfast dish consisting of poached eggs, cooked in a spicy pepper and tomato sauce mixture. Other spellings for this dish include “Chakchouka” and “Shakshuka.” My Vegetarian Shakshuka recipe was not passed down by my mom, but rather was developed over time, with trial and error. 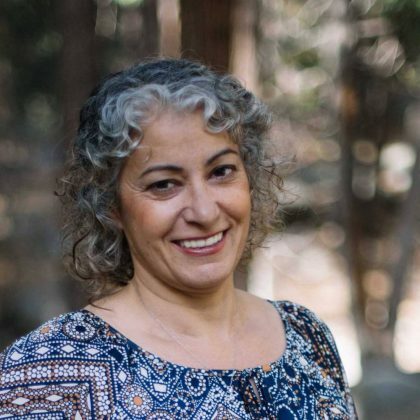 However, mom did make a similar Iraqi dish called “Makhlama” in which the eggs were scrambled in with the tomato sauce and ground lamb mixture. 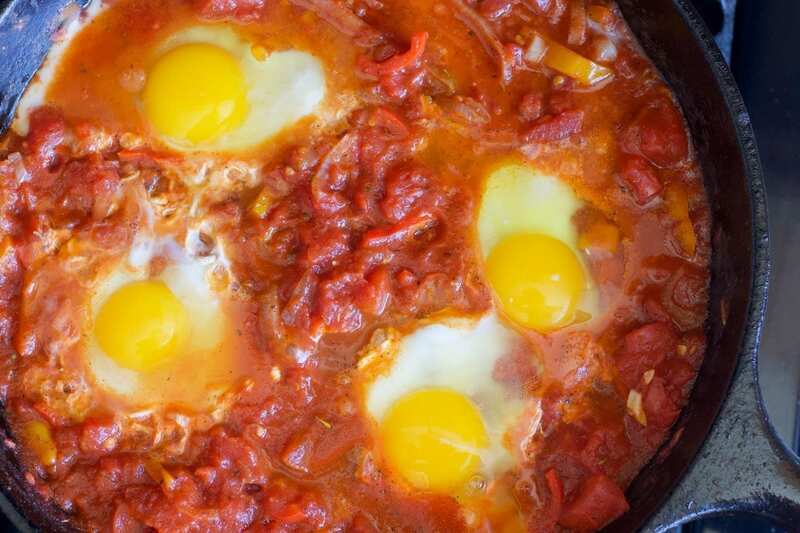 But unlike my mom’s version, Shakshuka is known for its poached runny-gooey egg yolks. Sure you can cook the eggs longer if you prefer your eggs hard, but where’s the fun in that? 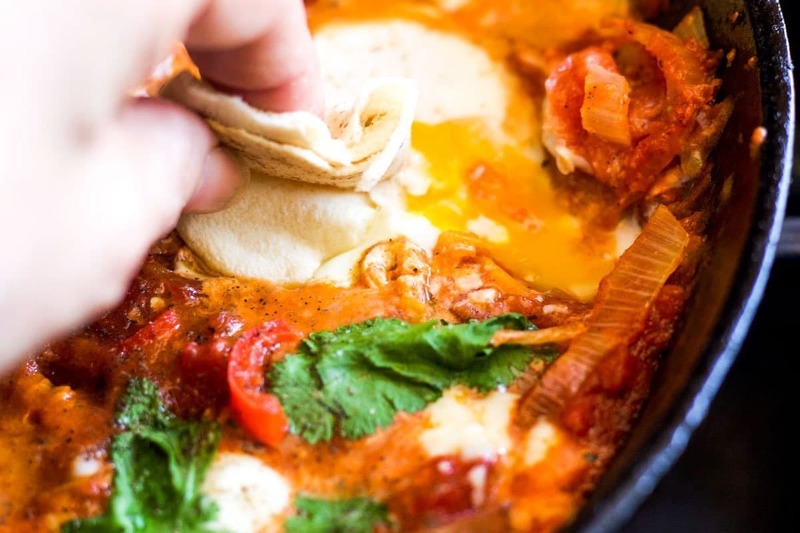 Everyone knows that dipping Pita Bread into the runny yolks is the best part of eating Shakshuka! Shakshuka is one of those popular dishes that can be cooked in various ways. 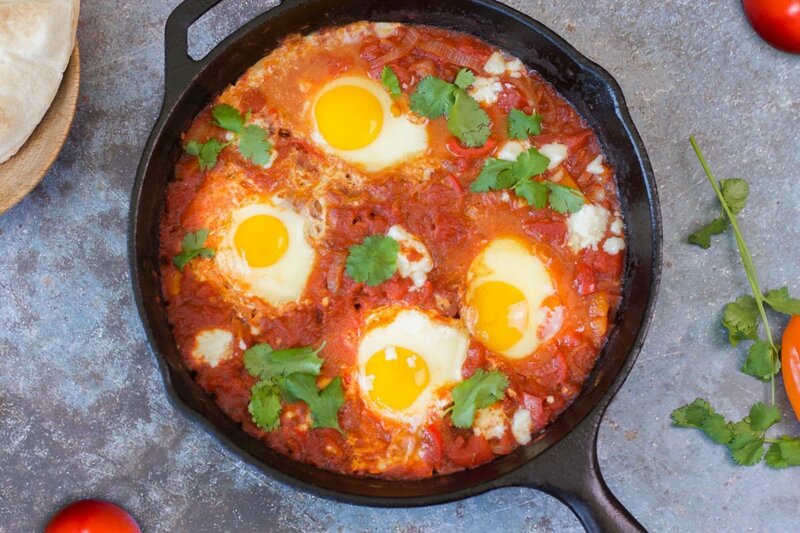 My Vegetarian Shakshuka recipe is just one of many ways to prepare this dish. While my mom scrambled the eggs in with the sauce, there are those that add ground lamb to the tomato sauce, to make non-vegetarian shakshuka. Some even add chorizo, giving this Middle Eastern dish a Mexican-twist. The spice combinations used is yet another way to alter the recipe. The most common spices used include paprika, cumin, chili powder, coriander, cayenne powder, salt, and pepper. Finally, feta or goat cheese, along with fresh chopped herbs like cilantro, parsley, or mint can be added just before serving. 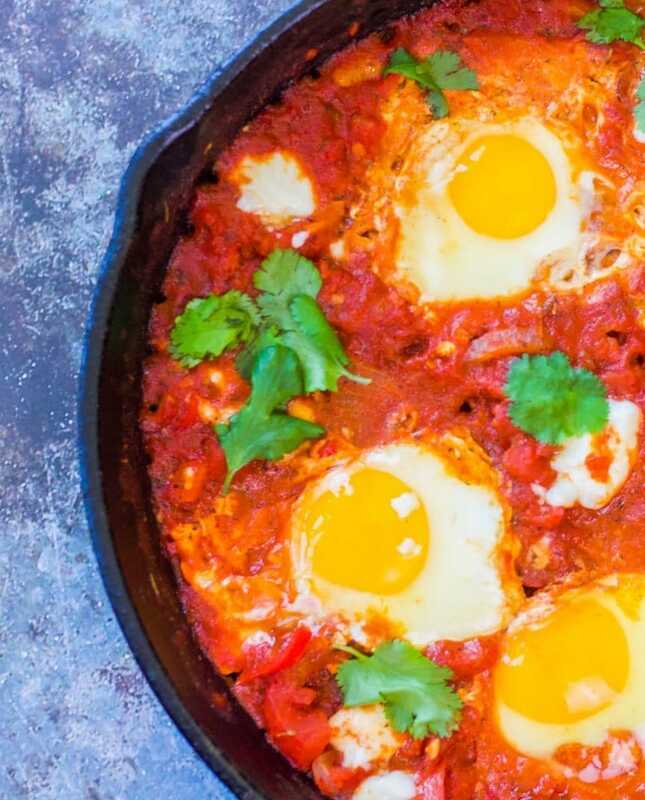 Like many Middle Eastern dishes, Shakshuka’s origin is often disputed. However, it is usually narrowed down to three places; Yemen, North Africa, and Isreal. I can’t be certain who is responsible for this delicious dish, but one thing for sure, it’s not an Assyrian dish. 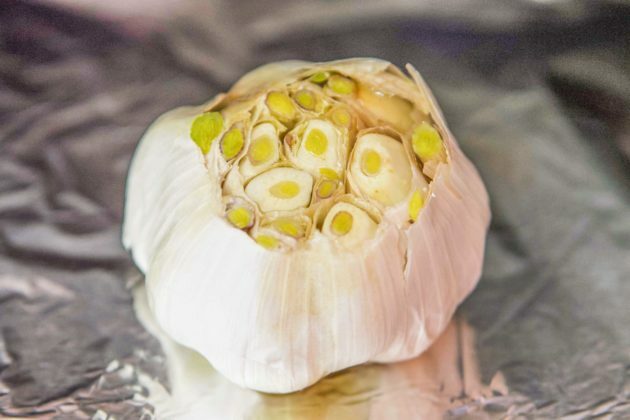 To learn more about the origins of this popular dish, check out this great post. In some countries, like Morroco, Shakshuka is cooked in a Tagine. However, more often, Shakshuka is cooked on the stovetop in a cast iron skillet and sometimes finished off in the oven. 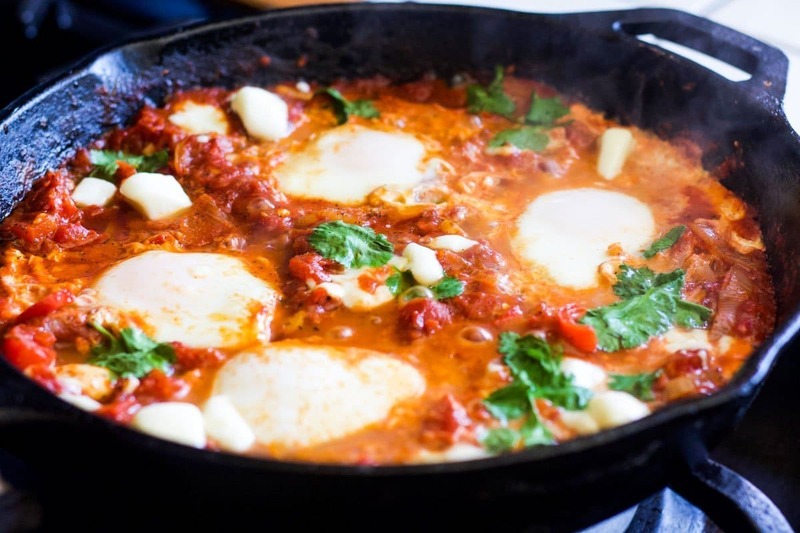 Shakshuka is usually served accompanied with Pita Bread or lavash flatbread, which is torn and dipped into the runny yolks and the spicy tomato sauce. Not much else is needed since this is a very filling dish, except perhaps a nice cup of Middle Eastern tea or chai. Sometimes Shakshuka is served for dinner instead of breakfast. If you want to do the same, serve some Tabouli on the side for an authentic Middle Eastern meal. Furthermore, if you have family members that are not vegetarians, consider serving kofta kabobs as well! 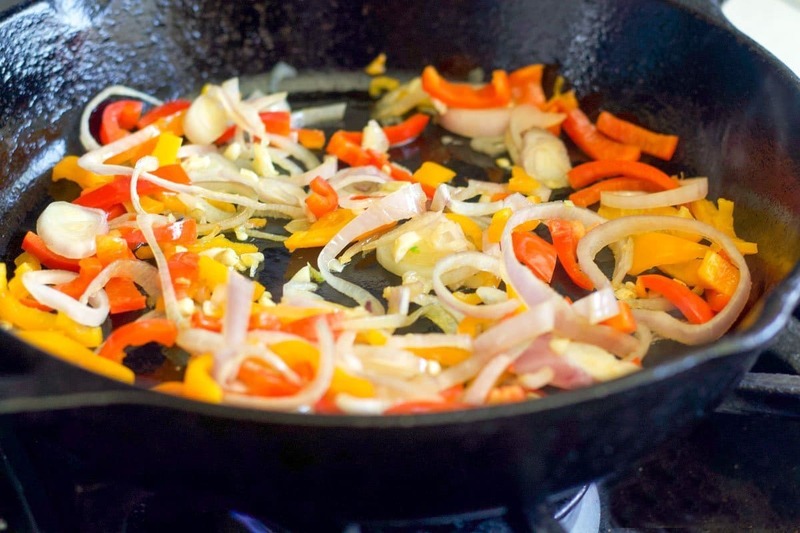 Heat oil in a castiron skillet. Saute shallots, peppers, and garlic until slightly caramelized. 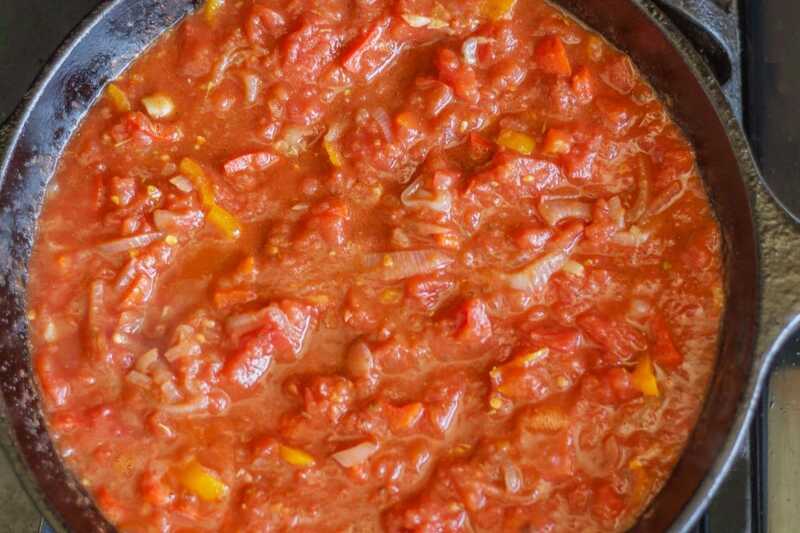 Pulse one of the cans of diced tomatoes for a few seconds, then add all of the tomatoes to the pan. Mix in salt, black pepper, cumin, crushed red pepper, paprika, sugar, thyme, and basil. Simmer for 15 minutes on low. Make three holes in the sauce (one at a time), and crack an egg into each. Cook for an additional five to ten minutes, or until the eggs are cooked to your satisfaction. Covering the pan will speed up the process. Serve with pita bread or flatbread, and don’t be afraid to use your hands to dig in! 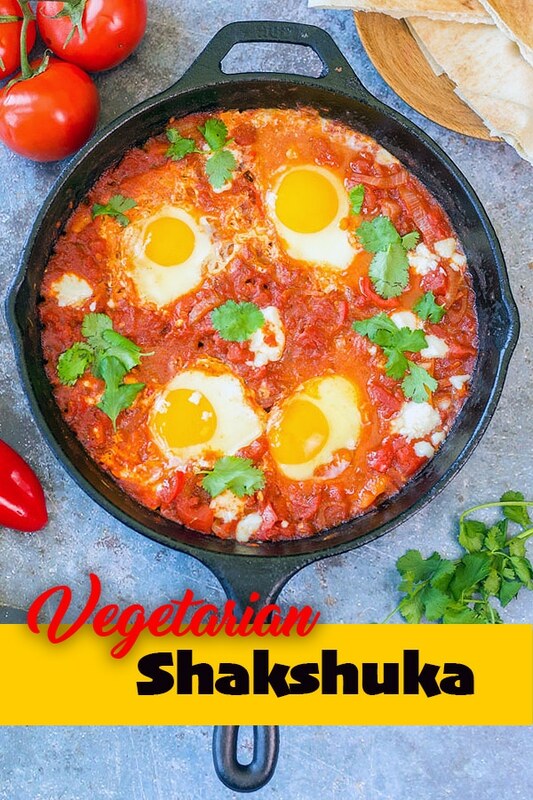 If you love this Vegetarian Shakshuka recipe, please give it a 5-star rating! Poached eggs cooked in a spicy pepper and tomato sauce mix. Heat oil in a castiron skillet. Saute shallots, peppers, and garlic until slightly caramelized. Make four holes in the sauce (one at a time), and crack an egg into each. Cook for an additional five to ten minutes, or until the eggs are cooked to your satisfaction. Covering the pan will speed up the process. Serve with pita bread or flatbread on the side. Now that I know about that place, I want to try it too! Scott and I are talking about going maybe next year.